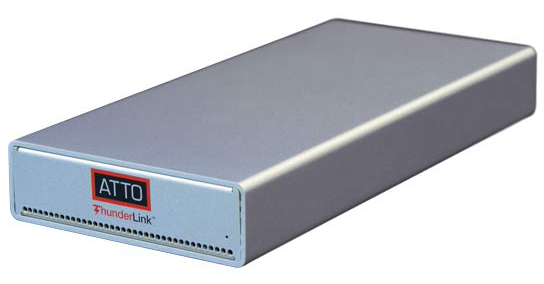 The ATTO ThunderLink SH 3128 acts as an external Thunderbolt to SAS/SATA adapter, connecting the latest Thunderbolt desktop and mobile workstations to 12Gb/s SAS/SATA storage devices including LTO 8 tape drives. With up to 2750MB/s of SAS throughput, 12Gb/s SAS ThunderLink adapters are designed to provide flexible and scalable connectivity to SAS/SATA storage, and are engineered to manage latency for real-time environments. Delivering creative, engineering and technical professionals a high performance and low latency Thunderbolt connectivity solution engineered for applications where optimized performance and high throughput are essential. ThunderLink adapters enable today's Thunderbolt enabled desktop and mobile workstations to connect into high performance storage or networks. 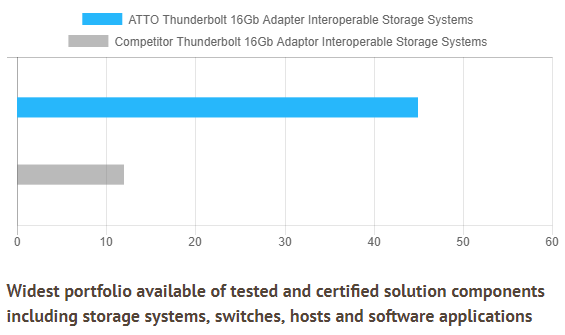 ATTO Technology utilizes 30 years of experience in reliable storage connectivity, history as an original Thunderbolt developer and an extensive depth in building media solutions to bring first-to-market high performance connectivity solutions to customers. 12Gb SAS/SATA adapters are an ideal Thunderbolt 3 solution for users looking to achieve efficient storage scalability. The integrated family of ThunderLink adapters boasts an extensive list of customer design wins and certifications with respected industry partners including the latest LTO-8 tape drives. 12Gb SAS/SATA adapters are designed to provide flexible connectivity to SAS/SATA storage, and are engineered to manage latency for real-time environments. ATTO exclusive Advanced Data Streaming (ADS) Technology maximizes CPU processes to deliver smooth and reliable data transfers and the highest consistent performance. 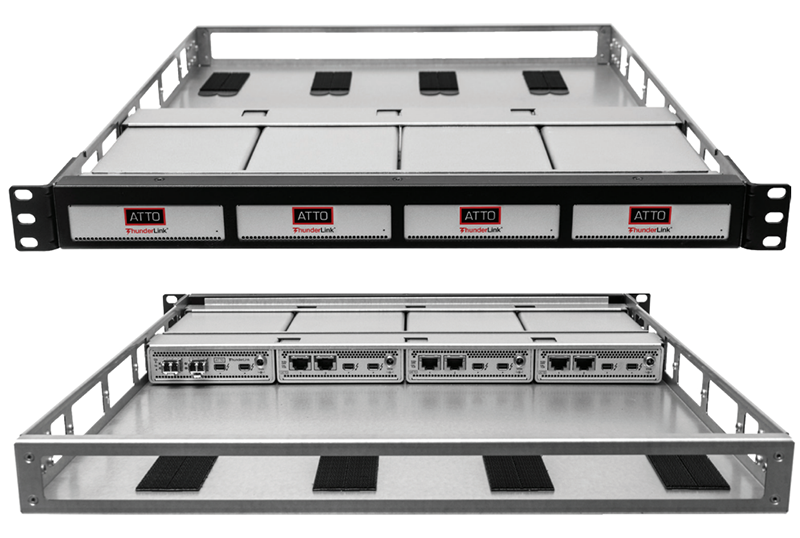 ATTO pays close attention to detail in borad design and signal integrity to minimize transmission errors and data corruption. These differentiating capabilities make ATTO the premier choice for high-performance direct-attached SAS/SATA storage connectivity. ATTO easy-to-use ConfigTool features an intuitive GUI that simplifies the installation, management and monitoring of the Thunderbolt adapter. With advanced troubleshooting and performance tuning capabilities, ConfigTool provides users with sophisticated diagnostics and the flexibility to control settings for specific applications. 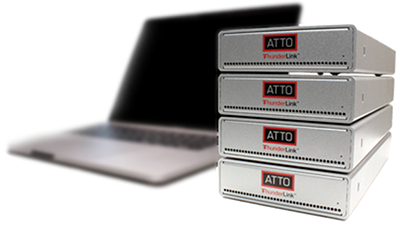 ATTO ThunderLink SAS/SATA adapters deliver high-performance and reliable connectivity solutions for the most demanding storage environments, including digital content creation, tape streaming and backup, rich content delivery, server clustering, and complex database. 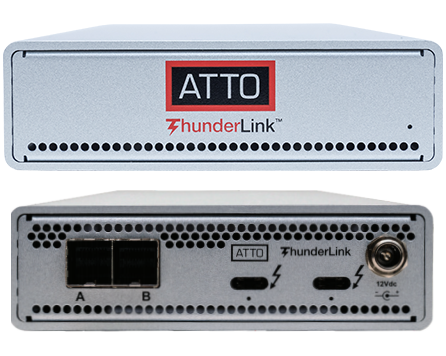 ATTO ThunderLink SAS/SATA adapters enable users to achieve the ultimate in I/O performance for real-time and transactional applications.